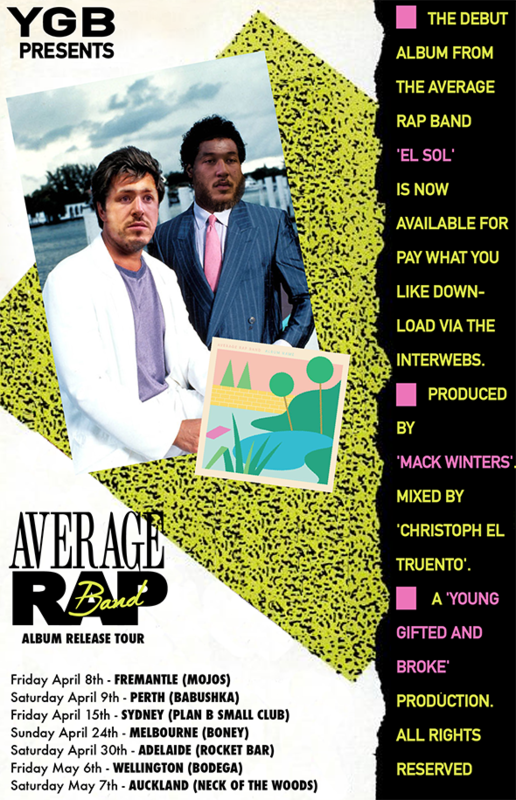 Created from 42 degree days in the hell fire of Collingwood, the debut album from the world’s most Average Rap Band; “El Sol”. Rebelling against the duo’s former magnum opus “@Peace and The Plutonian Noise Symphony” comes an anti avant guarde peace of work that walks the fine line between yoko and YOLO. Produced with instruments older than the musicians playing them and recorded strictly to tape it is perhaps the greatest album of 1983 in 2016. If you want to relive the nostalgia of an era that never existed get your tickets to one of the Australasian shows below and be prepared to dance your little feet into early onset arthritis.